The last part of this stitch sampler done in 2010. 7.Chain are worked over three straight stitches in the first sample. The second sample is similar to the first with the straight stitches emerging from the same point and their inverted version is also worked in the end of the row. In the third sample, after working the straight stitches, the chains are worked to form a pattern. 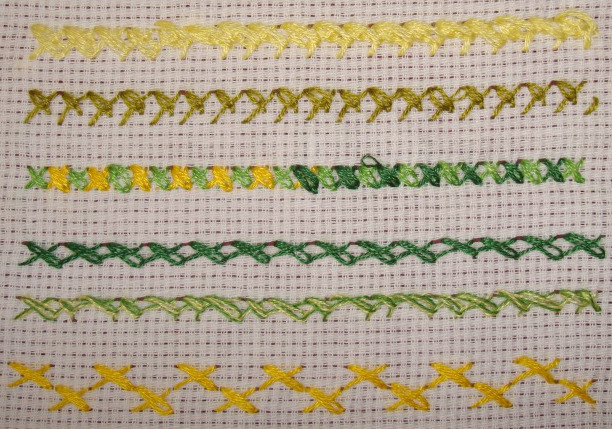 The fourth sample has three chain worked over slanted straight stitches. 8. 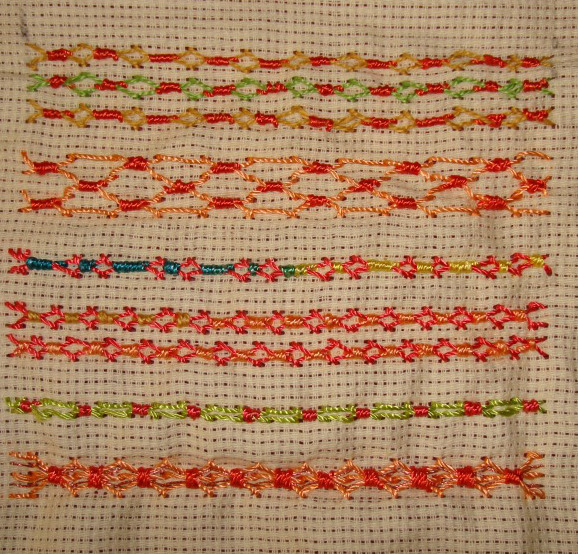 The chains are worked to form a pattern over large cross stitches in the first sample. 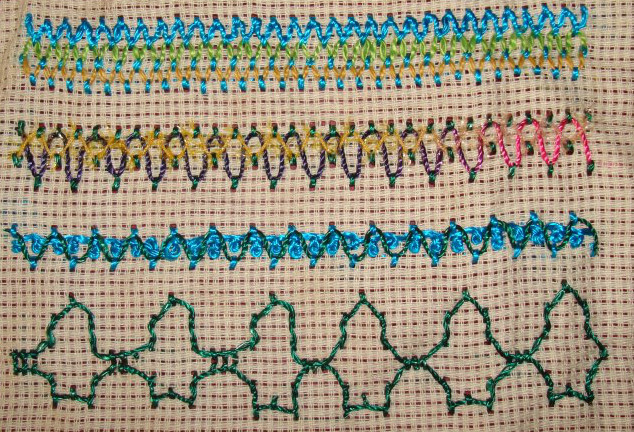 Ablong tall cross stitches are again crossed with horizontal chains in the second sample, the third sample is a pattern worked with vertical chains over ablong crosses. Chains are worked over ablong wide crosses in the fourth sample. Chains with long tails are worked over ablong wide crosses in the last sample. This was really a long sampler, after writing these details I don’t have anything to write about this stitch! The second half of the sampler. 5.The upright version of chained cross stitch is worked in the first sample, the regular version and the upright version are alternated in the second sample. 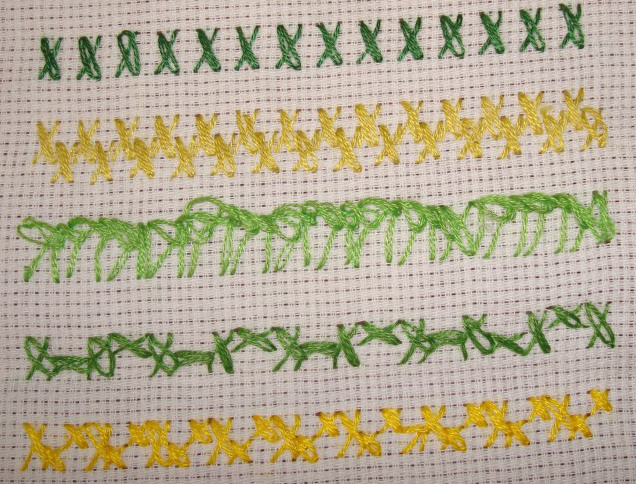 Two rows of upright chained cross stitch are worked together in the third row. The half cross stitch and the chain are angled away and worked horizontally in the fourth row. Two chains are worked over long half crosses in the third row. The half crosses were worked first, then the chains were worked on them. 6.Chained cross stitch is worked in the type of herringbone stitch in the first sample, can be chained cross herringbone, a long name for a simple stitch! Closed version of the same stitch is worked in the second sample. The half crosses were at a steep angle and the chains were at 45* angle in the third sample. 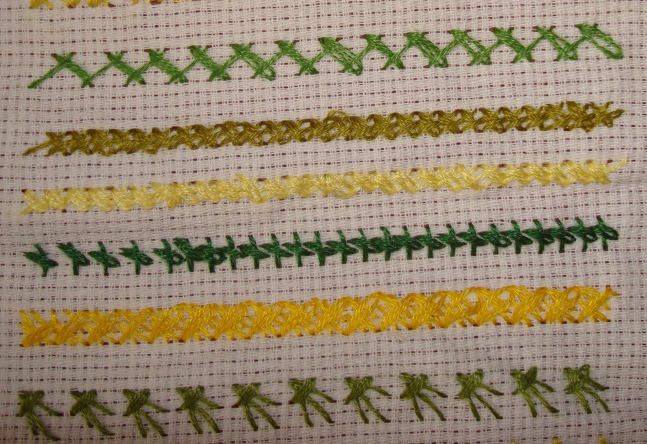 The chains are worked at an angle crossing the straight stitches in the fourth sample. The chains are worked over three half crosses in the fifth sample. The half crosses emerge from the same point and chains were worked over them in the last sample. Most of the samples the half crosses or straight stitches wre worked in arrow and chains were worked over them. 3.The longer version of this stitch is worked in the first row. 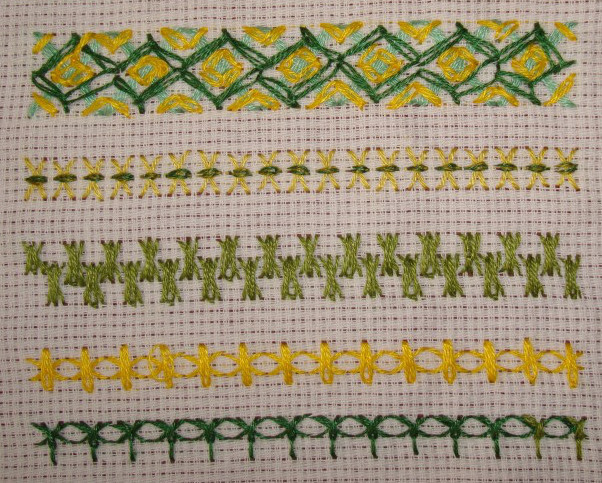 A pattern is worked in the second row with long chained cross stitches. I don’t remember what mess this third row is! And I think the fourth row is an attempt to work the long and wide version of this stitch in a zigzag manner. 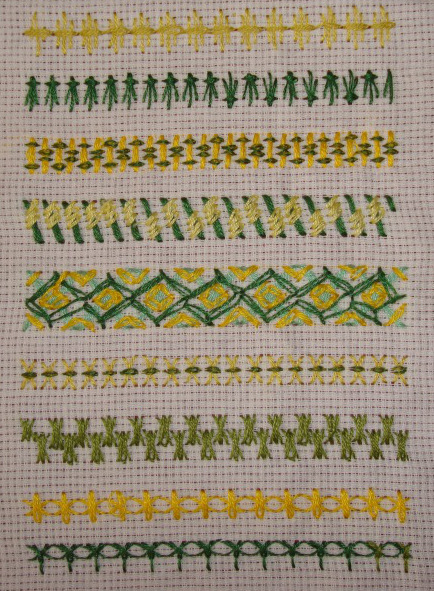 The last row in this part of the sampler is a pattern worked with long and square chained cross stitches. 4. In the first row, the long and short version of chained cross stitch stitches are worked alternatively. 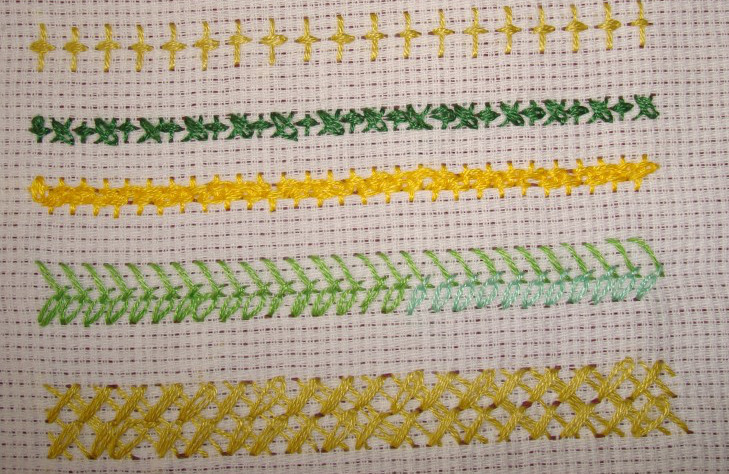 In the next two samples, chained cross stitch rows are laced with rimjim thread. This stitches worked in zigzag manner is whipped with yellow cotton skein [6 strands] in the fourth sample. Rimjim thread is couched down with chained cross stitch in the last sample. This week’s stitch on SharonB ’s TAST 2013 stitch challenge is chained cross stitch. 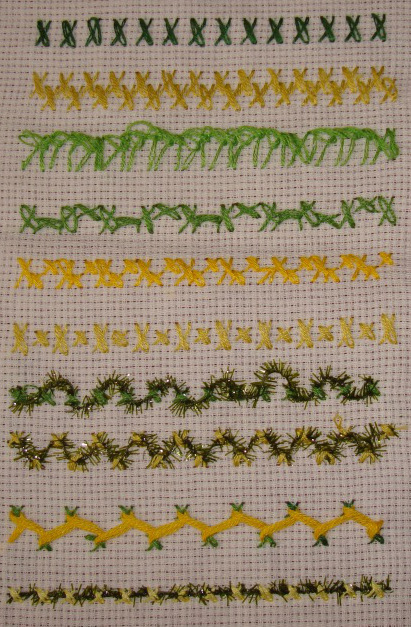 I had worked this stitch sampler after the TAST 2010 [this was the 26th week’s stitch then] challenge. I did not post the details of this sampler on my blog. I ‘ll start with the details now. This is the first part of the sampler worked . 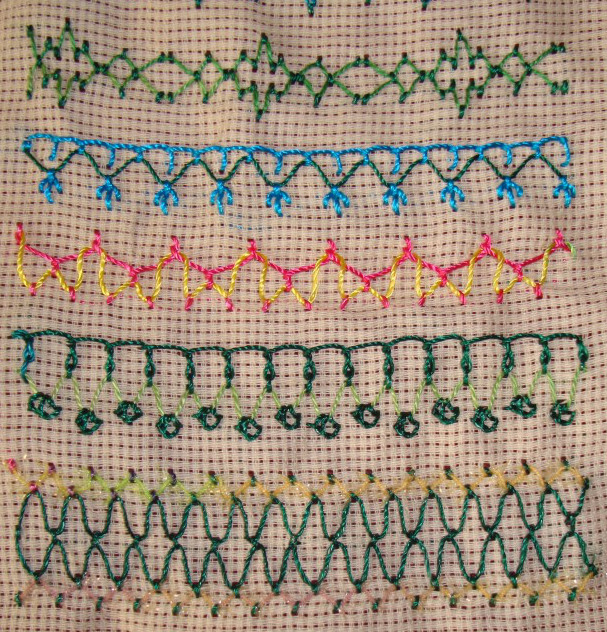 1.I started with individual chained cross stitches, moved to work this stitch in a continuous line.in the third row the chains are worked with different colour thread. 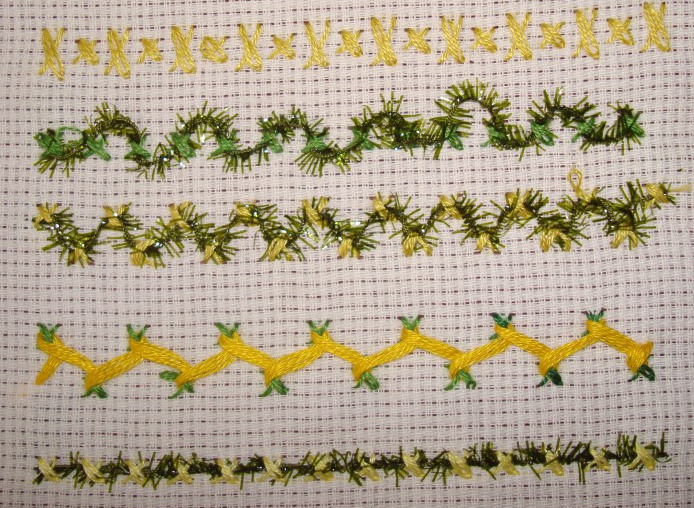 Twisted chain stitches are worked over half crosses in the third row. 2. In the first row, half cross stitch was worked first and the chain stitches just go around the starting point of the next half stitch. [the chain stitches did not stay there, they just moved half way across the next stitch!]. In the second row the chain stitches are worked half the length of the cross stitch. 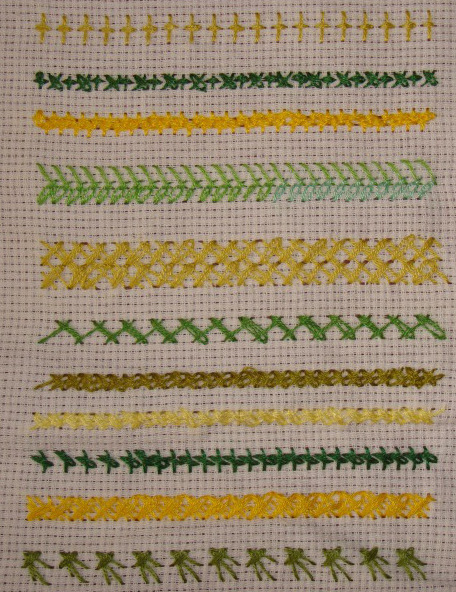 Alternate chained cross stitches are worked in different colour in the third row. 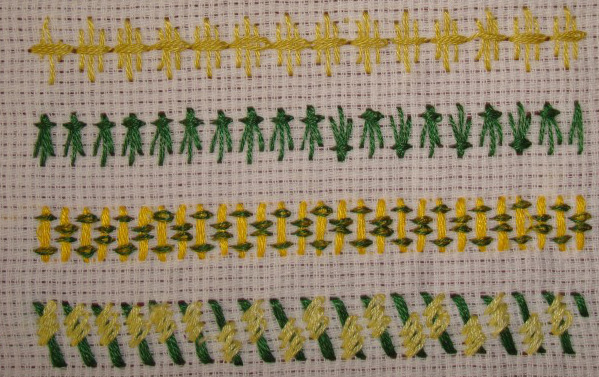 Wider version of the stitch is worked in the fourth row. Two colours are threaded together into the needle to work the fifth row. last row is chained cross stitch worked at different heights. 9. 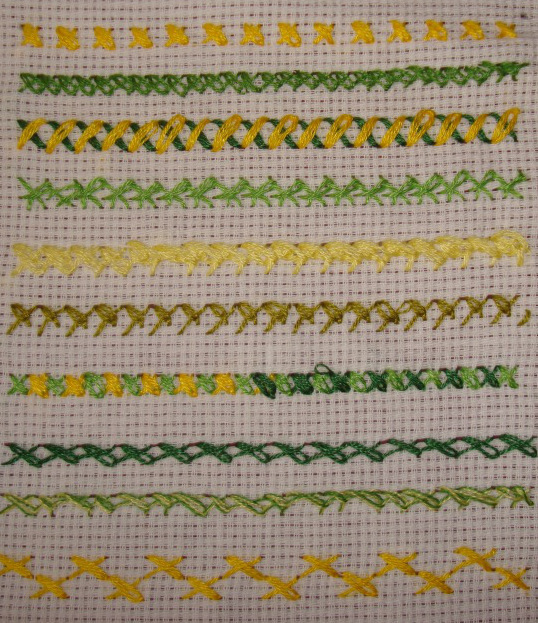 This sample is worked with blue, green and yellow threads. 10. Variegated polyester thread cloud filling stitch is overlapped with rimjim thread. 11. Cloud filling stitch line is worked over wrapped coral stitch in this sample. 12. I tried a row of peaks and valleys in this last sample. I tried some more variations. 5.In this sample, I am still in the Florentine mode. 6. Buttonhole stitch and fly stitches are used to work the cloud filling. 7. First sample is worked with cretan stitch, I am not too satisfied with this variation. The second sample has basque stitch and buttonhole variation for the cloud filling. 8. I used polyester thread and rimjim thread to work this variation.